Women’s hair Surgery is fast becoming the trend in todays society. Whether you are suffering from Traction Hair Loss or Female Pattern Baldness we can help. If you want your hair line back or want to fill in those areas that have shed then give us a call and find out how we can help you. The Consultation is free. Why not arrange a visit now and see how we can help. We are located a stones throw from Harley Street without the Harley Street prices. Look forward to seeing you soon. Book a consultation by filling in the short form above or at the bottom of the page and we will get back to you shortly. Consultations take around 30 minutes. We advise that you bring a friend or relative along if you wish who may have questions too. At consultation we will discuss your suitability, examine the hair and scalp (by a trichologist) to make sure there are no other possible ways to re grow your hair. We will fully explain the procedure and answer any questions the you have. If you are a suitable candidate then we will discuss how may grafts you require and will give you a price. Please note that we do not charge per graft but for the complete procedure. This is to ensure the patient gets what they want and that there are no charges bought on at the last minute if we need more grafts. Traction loss – many women suffer from traction hair loss. This being a result of hairdressing procedures or incorrect hair styling. What ever the cause, the hair shed will be permanent. Suitability on women’s hair surgery will be how severe the hair loss is. Remember, there must be sufficient unaffected hair to transfer to the affected site. Traction hair loss is solely due to the epilation of hair and nothing to do with nutrition or hormonal imbalances. Female Pattern Baldness (FPB) (androgenetic) – women’s hair surgery is the only true way of giving back hair to a female who is suffering from such a condition. However, there are restrictions. Severity is of course a consideration along with how much donor hair there is. It is of the upmost importance to have this condition correctly diagnosed. I have seen hundreds of female patients who have been told they have FPB when in fact they have a chronic hair loss condition that is nothing to do with androgens. Women’s hair surgery in this case would not be suitable. We are highly trained Trichologist who know how to diagnose correctly. Plastic surgery patients – those women who have had plastic surgery and are concerned about the incision sites. Hair may be transferred to hide scar tissue. Women’s hair surgery is a suitable option in this case. Burns and Scars – Women’s hair surgery may be an option in cases of burns or scar victims. However, this will be dependant on the severity of the skin damage and donor hair available. Alopecia Areata – please note that it unlikely that any surgery can be completed on a patient with Alopecia Areata. Some say that if you haven’t suffered from the condition for 12 months then this is ok. Well in my view it’s not. If you would like to speak with us please feel free to give us a ring and we can askew any questions that you have. Different methods of women’s hair surgery – There are two main types of surgery available. FUE (follicular unit extraction) and FUT (follicular unit transplantation). If you click on the heads you will be taken to a more in depth explanation of each type of hair transplant. Considered the most advanced method of women’s hair surgery. A highly technical procedure where hair is removed from the donor site with specialist instruments (less that 1mm). Hair is then transplanted. Once transferred the hair will grow quite normally. Hairs may be implanted in groups of 1-4 hairs depending on the thickness required and donor site amount. This method had the fastest recover time. Surgical procedure does not require overnight stays. Patients will be given a local anaesthetic and will be fully awake throughout the procedure. For women’s hair surgery this is really the best method. Hair will be taken from a vast area instead of the localised FUT method. a strip of skin is taken from the back of the head. Donor Size and amount of hairs will vary. The skin will contain the hair awaiting transplantation. Trained technicians will dissect the hair ready for the surgeon to implant in the area required. The wound will be sown but a linear scar will remain. It is fair to say this would not be visible as the gap would be closed and surrounding hair would amply cover this up. Most Women prefer this method. There is no need to shave the head at the donor site. The results are the same. Recovery time for the scare to heal is around 5 weeks. However, you will be able to go back to work within a few days. We recommend taking a week off to relax. So how would you find out if you are suitable? That’s easy. Arrange a free consultation with one of our Trichologists. We will firstly, diagnose the hair loss condition after which decide if surgery is suitable. We have seen thousands of women with hair loss over the years. Many have been suitable candidates for women’s hair surgery. Please be mindful that most hair restoration surgeons are not trained Trichologists which means they are experts in the transplant surgery and not experts at diagnosing hair loss. There are also many women’s hair surgery clinics run by untrained sales men or women. They of course would have a good knowledge of the surgical procedures but not at establishing a diagnosis and confirming suitability. I have seen many women who should never have had surgery. Who ever you choose to see just ask for the credentials of the person you are speaking to. 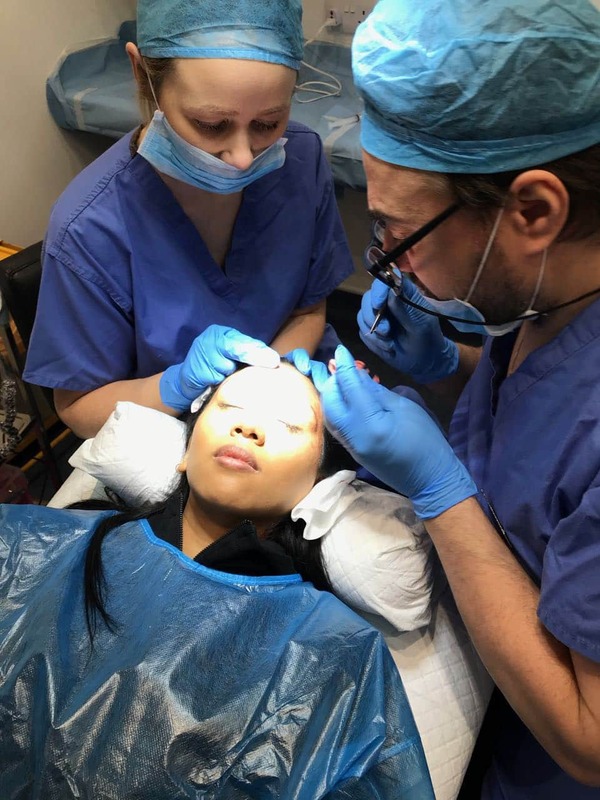 If you are considering women’s hair surgery then we hope that you will come and see us. It is a free consultation during which we will confirm your suitability. Price – this of course will vary from patient to patient. However, a typical cost will be £3000-£5000.